You finally got around to fixing up that old bathroom and now you’re left with the junk from demolition day. Don’t just toss your old light fixtures to the side! With these fun ideas, turn old light fixtures into new backyard decorations with these easy crafts you can complete with your kids. Those old glass flush mounts are the perfect shape for a decorative new bird bath. Attach some wire rope to the holes left behind in the flush mount from screws so that you can hang the new bird bath. Grab some glass paint and have kids decorate the flush mount with fun new colors to attract wildlife. Once the paint is dry, hang your new DIY bird bath on a tree or rod iron post, fill it with water and watch for all the unique bird types that will come pay you a visit. Your old fluted glass shades can also be used as fun crafts for new yard decorations. What you’ll need is your glass shades, some LED path lights, super strength glue and spray paint. First, you and your family can spray paint your fluted glass shades fun colors like pink, yellow, and blue to resemble flowers. Once dry, stick your LED path lights into the opening of your fluted glass shades and superglue the glass to the base of the light so that it won’t fall apart. Place your fun new garden lights along walkways or in flower arrangements for a great new outdoor light decoration feature. If you’ve found yourself looking for what to do with your glass globe-shaped light fixtures, there’s one last craft that will make a great garden decoration for your home. Grab some string, hot glue, soil, and an array of succulents. First, hot glue your string around the circumference of your glass globe so that the opening is will be on its side when hung. After the glue has stuck, you can begin building your own terrarium. First add soil, then have your kids place succulents inside to make a fun little environment. Hang your terrarium on the front porch or in a tree! Make the most of your spring break with these fun crafts to do with your family while also recycling old bathroom light fixtures! 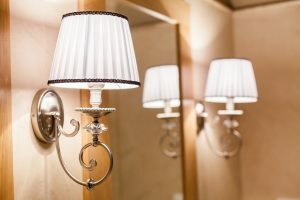 With your old light fixtures making your yard and garden pop, stop into your local Hortons to find great new light fixtures to update your bathroom with.